Comprising Eye-Openers and More Eye-Openers plus R. W. Hull's Supreme Mental Discernment. A Trick Exposed, But How? 1st edition 2006, 1st digital edition 2014, 94 pages. 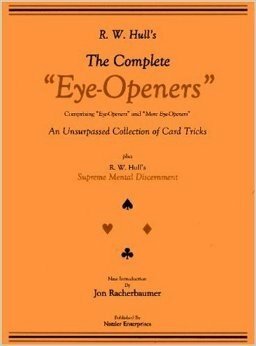 I own a lot of Card Magic Books and The Complete Eye-Openers is among my favourites. Ralph Hull was way ahead of his time. The Magic here is still good. Well done Natzler Enterprises and Paul Gordon for bringing it back better than ever. The new typeset is excellent. This book is an university of reading within card magic, it's a diamond bar for all magician a link! The 4 aces tricks within the pages! The jolly jumping joker Paul Gordon have assembly one of the best fantasy mind who use 52 friends! (bicycle cards) to wow friends! This is a musical book of grateful effects that rocks!